Houston Dash forward Rachel Daly scored twice as the Dash kept close to the playoff race with a 2-1 win on the road over Sky Blue FC on Saturday night. The Dash improved to 26 points (7-8-5) with four games remaining, still four points behind the fourth place Orlando Pride at the conclusion of Week 20’s games. The loss drops Sky Blue FC to 0-14-4, and the team is still in search of their first win of the season. Daly scored her first goal in just the 7th minute. 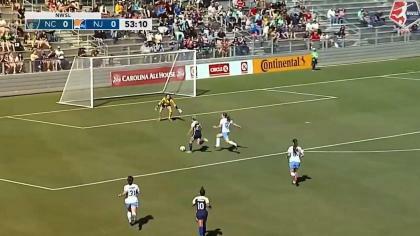 Dash forward Kealia Ohai turned on the jets down the left sideline and dribbled into the box around Sky Blue defender Christina Gibbons. Ohai’s cross found Daly for a one-time finish into the roof of the net. Sky Blue FC tied the match in the 64th minute with a goal from Madison Tiernan. Savannah McCaskill‘s shot was saved in the box by Dash goalkeeper Jane Campbell, but the rebound went to Tiernan to make it 1-1. The Dash took the lead in the 73rd minute on a penalty kick from Daly. 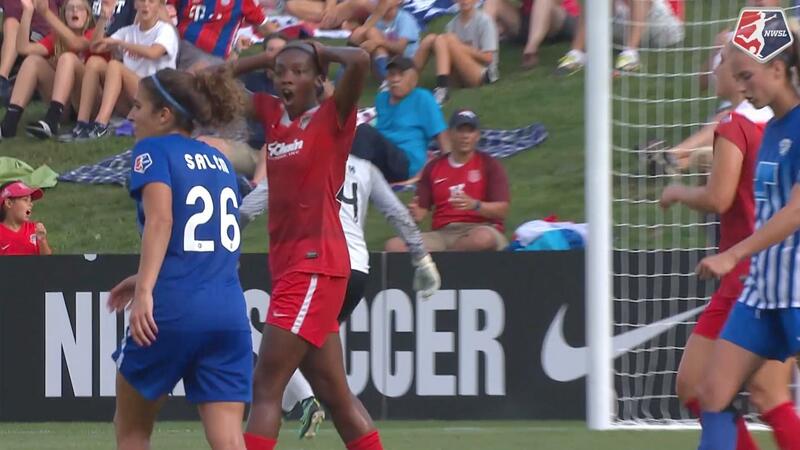 Houston was awarded the penalty when Raquel Rodriguez was called for a handball in the box on a cross that was taken by Daly. The penalty is the first of Daly’s career and her ninth goal of the season. Sky Blue FC goalkeeper Kailen Sheridan made nine saves in the match to keep the game close for Sky Blue. In the 31st minute, she stopped a free kick that was chipped over the wall from Amber Brooks. Then in the 43rd minute, she stopped a deflected shot from distance by Sofia Huerta. In the 53rd minute, she stopped Veronica Latsko point-blank, before stopping Thembi Kgatlana in the 82nd minute. Campbell made five saves her own in the win, including a 29th minute stop on Imani Dorsey. Daly appeared to have had another goal in the match in the 28th minute, but the ball was ruled to have not fully crossed the goal line before Sheridan got a hand on it. Gibbons was forced to leave the match in the 36th minute after appearing to injure her leg on a strong defensive play in the box. She was replaced by Rebekah Stott, her first minutes since June 2nd after missing time due to injury. The Dash took more shots (21-16), shots on goal (11-6) and corner kicks (8-4) than Sky Blue FC. They also held the better of possession, 56.7% to 43.3%. 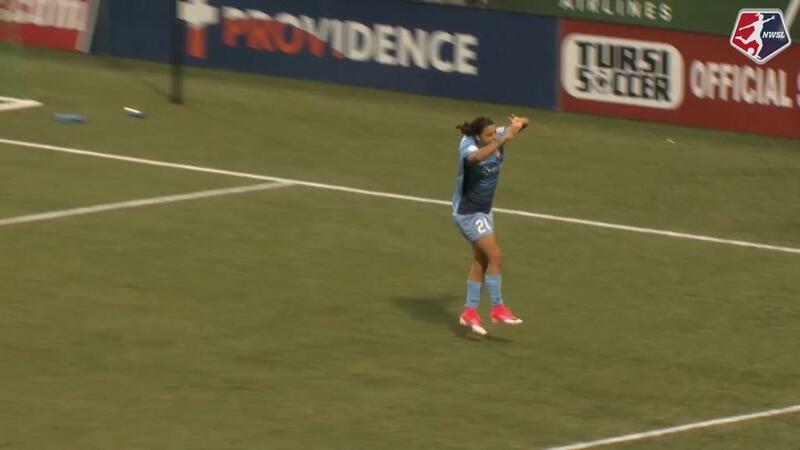 Sky Blue played the match without Carli Lloyd, who was suspended after being issued a red card for a handball in the box in the 96th minute last week. The Dash will next face the Spirit on Friday night. Sky Blue will host Utah Royals FC on Saturday. Match ends, Sky Blue 1, Houston Dash 2. Second Half ends, Sky Blue 1, Houston Dash 2. Attempt blocked. Madison Tiernan (Sky Blue) right footed shot from outside the box is blocked. Substitution, Houston Dash. Savannah Jordan replaces Kealia Ohai. Attempt blocked. Sarah Killion (Sky Blue) right footed shot from outside the box is blocked. Assisted by Raquel Rodríguez. Attempt blocked. Imani Dorsey (Sky Blue) right footed shot from outside the box is blocked. Assisted by Amanda Frisbie. Attempt blocked. Rebekah Stott (Sky Blue) right footed shot from outside the box is blocked. Assisted by Raquel Rodríguez. McKenzie Meehan (Sky Blue) wins a free kick on the left wing. Offside, Houston Dash. Sofia Huerta tries a through ball, but Thembi Kgatlana is caught offside. Substitution, Sky Blue. McKenzie Meehan replaces Savannah McCaskill. Attempt missed. Sofia Huerta (Houston Dash) right footed shot from the centre of the box is too high. Assisted by Rachel Daly. Attempt saved. Thembi Kgatlana (Houston Dash) right footed shot from the centre of the box is saved in the bottom right corner. Attempt saved. Katie Johnson (Sky Blue) left footed shot from outside the box is saved in the bottom right corner. Assisted by Savannah McCaskill. Attempt missed. Katie Johnson (Sky Blue) right footed shot from the centre of the box is close, but misses to the right. Assisted by Savannah McCaskill. Attempt saved. Kealia Ohai (Houston Dash) right footed shot from a difficult angle and long range on the left is saved in the centre of the goal. Assisted by Thembi Kgatlana. Attempt saved. Sofia Huerta (Houston Dash) left footed shot from the centre of the box is saved in the centre of the goal. Assisted by Thembi Kgatlana. Offside, Houston Dash. Kealia Ohai tries a through ball, but Thembi Kgatlana is caught offside. Goal! Sky Blue 1, Houston Dash 2. Rachel Daly (Houston Dash) converts the penalty with a right footed shot to the top left corner. Penalty conceded by Raquel Rodríguez (Sky Blue) with a hand ball in the penalty area. Attempt missed. Katie Johnson (Sky Blue) right footed shot from the centre of the box is close, but misses to the right. Assisted by Dominique Richardson. Substitution, Houston Dash. Thembi Kgatlana replaces Veronica Latsko. Attempt missed. Katie Johnson (Sky Blue) left footed shot from the left side of the six yard box misses to the left. Assisted by Savannah McCaskill with a cross. Goal! Sky Blue 1, Houston Dash 1. Madison Tiernan (Sky Blue) right footed shot from very close range to the bottom left corner. Attempt saved. Savannah McCaskill (Sky Blue) right footed shot from the centre of the box is saved in the centre of the goal. Assisted by Raquel Rodríguez. Attempt missed. Linda Motlhalo (Houston Dash) right footed shot from outside the box is just a bit too high. Assisted by Rachel Daly. Attempt missed. Linda Motlhalo (Houston Dash) right footed shot from outside the box is close, but misses to the left following a corner. Attempt missed. Rachel Daly (Houston Dash) left footed shot from outside the box is close, but misses to the left. Assisted by Veronica Latsko. Attempt blocked. Madison Tiernan (Sky Blue) header from very close range is blocked. Assisted by Sarah Killion. Attempt saved. Veronica Latsko (Houston Dash) right footed shot from the centre of the box is saved in the centre of the goal. Assisted by Sofia Huerta with a through ball. Offside, Houston Dash. Rachel Daly tries a through ball, but Veronica Latsko is caught offside. Offside, Sky Blue. Amanda Frisbie tries a through ball, but Katie Johnson is caught offside. Attempt missed. Kealia Ohai (Houston Dash) right footed shot from outside the box misses to the right. Assisted by Veronica Latsko. Corner, Sky Blue. Conceded by Taylor Comeau. Substitution, Sky Blue. Dominique Richardson replaces Erica Skroski. Attempt missed. Savannah McCaskill (Sky Blue) right footed shot from outside the box is too high. Assisted by Sarah Killion. Attempt missed. Sofia Huerta (Houston Dash) right footed shot from the centre of the box is close, but misses to the left. Assisted by Taylor Comeau with a cross. Attempt saved. Sofia Huerta (Houston Dash) right footed shot from outside the box is saved in the centre of the goal. Assisted by Clare Polkinghorne. Sofia Huerta (Houston Dash) wins a free kick on the right wing. Attempt saved. Rachel Daly (Houston Dash) header from the centre of the box is saved in the bottom left corner. Assisted by Allysha Chapman with a cross. Attempt saved. Veronica Latsko (Houston Dash) right footed shot from the centre of the box is saved in the centre of the goal. Substitution, Sky Blue. Rebekah Stott replaces Christina Gibbons because of an injury. Delay in match Christina Gibbons (Sky Blue) because of an injury. Attempt missed. Linda Motlhalo (Houston Dash) right footed shot from outside the box misses to the left. Assisted by Clare Polkinghorne following a set piece situation. Attempt missed. Savannah McCaskill (Sky Blue) right footed shot from the left side of the box is just a bit too high. Attempt saved. Imani Dorsey (Sky Blue) right footed shot from the right side of the box is saved in the top centre of the goal. Assisted by Savannah McCaskill. Attempt saved. Rachel Daly (Houston Dash) header from the left side of the six yard box is saved in the bottom left corner. Assisted by Veronica Latsko with a cross. Attempt saved. Raquel Rodríguez (Sky Blue) left footed shot from outside the box is saved in the centre of the goal. Assisted by Madison Tiernan. Offside, Houston Dash. Amber Brooks tries a through ball, but Veronica Latsko is caught offside. Attempt saved. Haley Hanson (Houston Dash) left footed shot from the right side of the box is saved in the bottom right corner. Assisted by Kealia Ohai. Attempt blocked. Veronica Latsko (Houston Dash) left footed shot from the centre of the box is blocked. Assisted by Clare Polkinghorne. Veronica Latsko (Houston Dash) hits the right post with a header from the right side of the six yard box. Assisted by Sofia Huerta with a cross following a corner. Corner, Houston Dash. Conceded by Amanda Frisbie. Amber Brooks (Houston Dash) hits the left post with a left footed shot from the left side of the six yard box following a corner. Attempt saved. Savannah McCaskill (Sky Blue) header from the centre of the box is saved in the centre of the goal. Assisted by Amanda Frisbie with a cross. Offside, Houston Dash. Clare Polkinghorne tries a through ball, but Rachel Daly is caught offside. Goal! Sky Blue 0, Houston Dash 1. Rachel Daly (Houston Dash) right footed shot from the left side of the six yard box to the high centre of the goal. Assisted by Kealia Ohai.